October's CatLadyBox was the annual Black Cats Box...here's what was inside! Snap that picture fast, Mommy. I am not amused. * Featured Cat Lady Artist Michelle Faber: This print is titled "Moonlit Fall Forest"
* Cat Camoflauge Hat: I must admit when I pulled this hat out of the box I could not figure out what a camo hat was doing in my CatLadyBox...until I spotted the black cats!!! Too cute and clever. * Mysterious Black Cat Shirt: I could not get a picture to do this shirt justice as it's black on black, but it's beautiful and I adore longer sleeve tees! * Black Cat Zipper Pouch: I've got tons of zipper pouches but I'm crazy about the unique shape of this one. I don't know about you, but I've always got loose doodads that need to be contained in the bottom of my purse. * Starry Night Black Cat Ears: Because every cat lady needs to wear cat ears on Halloween! * Cat Camo Catnip Hat Toy: Matching hats for cats and cat moms!!! I think Mudpie looks adorbs in her hat but she begs to differ. She much prefers that it doubles as a toy. * Yin Yang Catnip Toy: Black and white kitties curled up together taking a nap, just waiting to be batted across the floor. Mudpie is more than happy to oblige! What fun these boxes are! The art this month is so gorgeous. And I just love the idea of matching hats for kitties and kitty moms. Mudpie, we happen to think you make the most purrfect hat model ever! 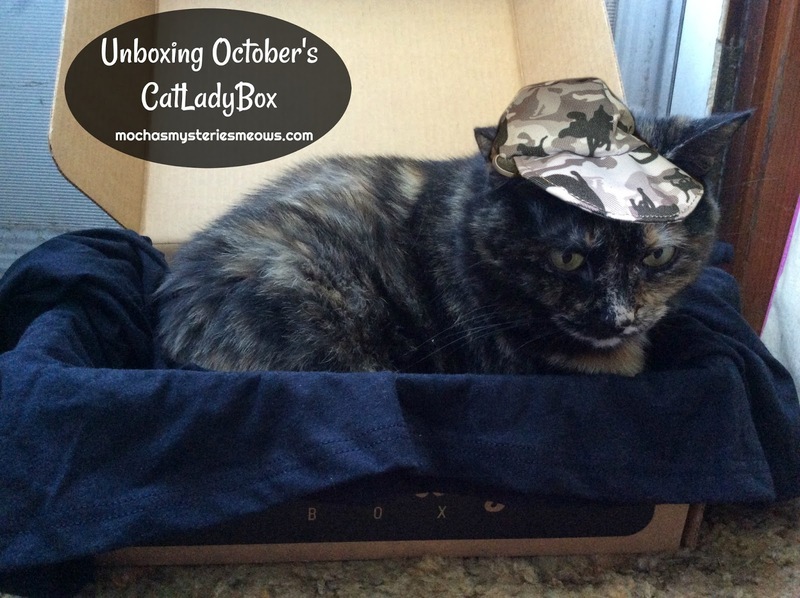 OMC, the matching camo hat and toy are totally cute! Those are really neat goodies. That picture is really cool too. Angel seems to enjoy wearing hats; Chuck not so much. Love the 'cat-moflauge'! The mom got the October box...a treat to herself for her birthday. Fortunately she hasn't tried to make any of us wear the camo hat...yet. Mudpie, you really do wear a hat well! They always come up with unique kitty items for the monthly boxes. TBT says he MUST have that black cat camo hat! Wherever did you get it? He has some shadow-camo pants and needs a hat to match!